Not only can you use mayonnaise on salads and in pasta salads or potato salad, it also is a necessary ingredient for ranch dressing, which you can make with homemade buttermilk. 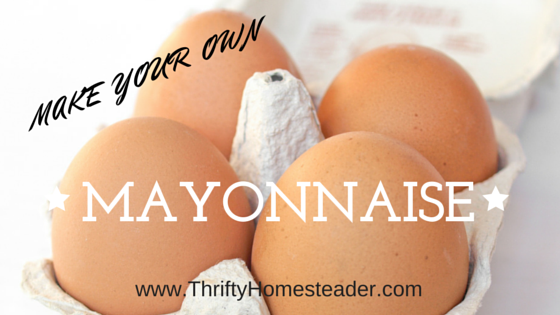 Mayonnaise falls into the “you can make that at home?” category because most people have never eaten homemade mayonnaise. Yes, in less than five minutes, with only four ingredients, you can make mayonnaise with either a blender or food processor. I made mayonnaise for twenty years using two eggs and then learned that the yolk really does most of the work, so if you are using egg whites for something else (like quiche), you can use one whole egg and two yolks. Put the eggs in a food processor or blender and blend for 30 seconds. Add the salt and lemon juice or vinegar and blend until mixed, maybe another 15 seconds, and then slowly add the oil in a little dribble with the blender still on high. Most traditional mayonnaise recipes include the dry mustard as a standard ingredient, but I often don’t use it, and I don’t see much difference in flavor. If you are planning to use the mayonnaise in a pasta salad or potato salad, you can add the spices from your recipe while the mix is still in the blender. About once a year for variety, I’ll make a Cajun mayonnaise by adding 1 tablespoon of chili powder and 1 teaspoon of paprika. The is an excerpt from Homegrown and Handmade: A Practical Guide to More Self-Reliant Living by Deborah Niemann.